Welcome to the June 2016 issue of our occasional newsletters. When talking of Georgian town architecture in Britain, places like Bath, Cheltenham, Buxton and even parts of London spring readily to mind. Melcombe Regis in Dorset is very little mentioned, not even as part of the port of Weymouth, yet King George III often spent his summers here. 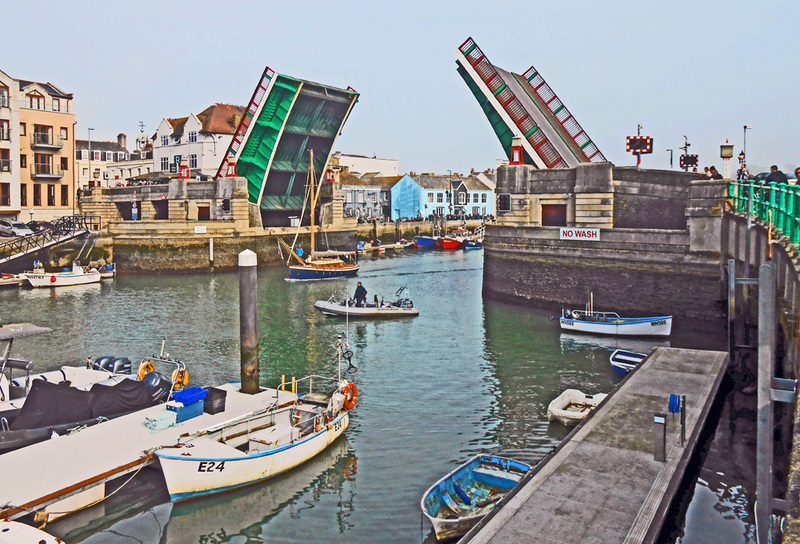 Weymouth is actually made up of two smaller ports, originally villages, that sit on either side of the mouth of the River Wey – with Weymouth on the south bank and Melcombe Regis on the north. Both were medieval settlements that competed as ports until 1571, when they were legally joined under a charter of Queen Elizabeth I and took the overall name of Weymouth. The first bridge linking the two parts was not built until 1597. Regis derives from the Latin ‘rex’ meaning ‘king’. ‘Regis’ means ‘of the king’, and many places in England have that name, such as Lyme Regis. Melcombe Regis did not acquire this name because of George III staying there in the late 18th and early 19th centuries. It was a royal borough belonging to the monarch, and seems to have acquired its name much earlier, during the medieval period. 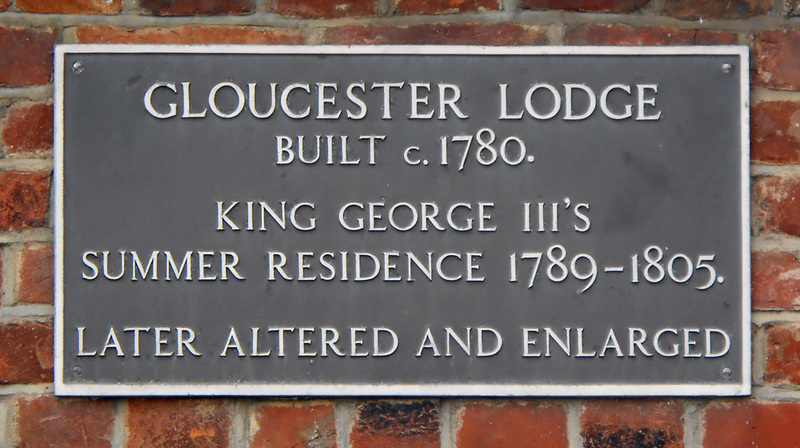 In fact, George III liked the place so much that he visited most summers until 1805. This put Weymouth on the map as a fashionable health resort, rivalling spa towns like Bath, and it was recommended that the sea water should not only be drunk but also bathed in. By now, its association with the plague had been long forgotten. Melcombe Regis actually has the dubious distinction of being the port where the first ship carrying the devastating ‘Great Plague’ (known later as the Black Death) arrived from Europe in 1348. This was the start of centuries of recurring plagues in Britain, which only subsided towards the end of the 17th century. Bathing became very popular, primarily for health reasons, and was often done from bathing machines that were rolled into the sea and afterwards pulled out by one or two horses. The bather could descend steps on the seaward side into the water. 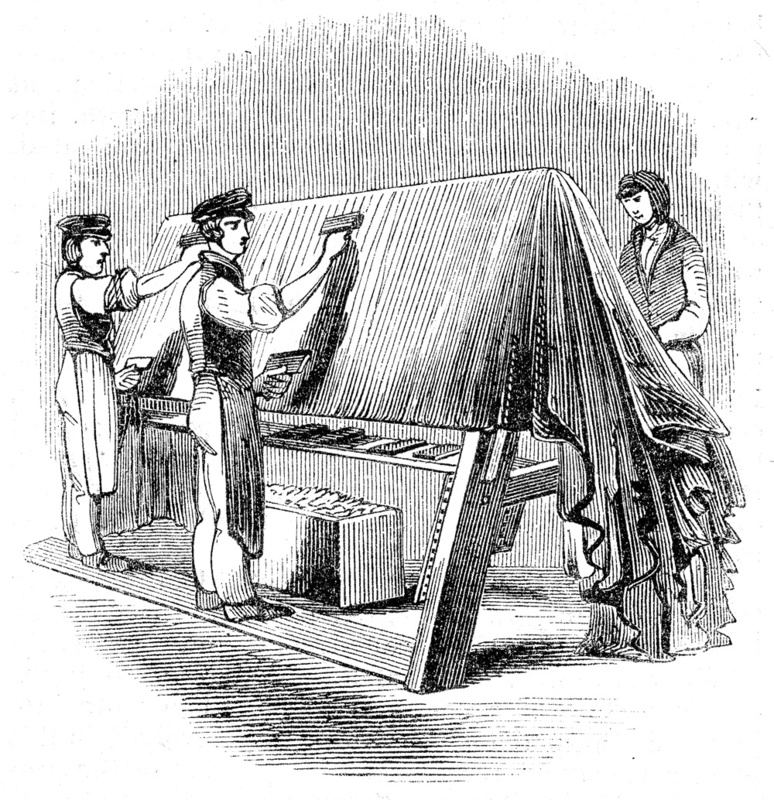 Essentially, these machines were mobile changing rooms that allowed easy access to and from the sea. In September 1804 Jane Austen wrote a long letter to her sister Cassandra in which she mentioned her own ‘delightful’ experiences of bathing that morning at Lyme Regis. Cassandra was staying further along the Dorset coast – at Weymouth. If anything, bathing increased in popularity during the 19th century, and bathing machines continued to be used up to the First World War. 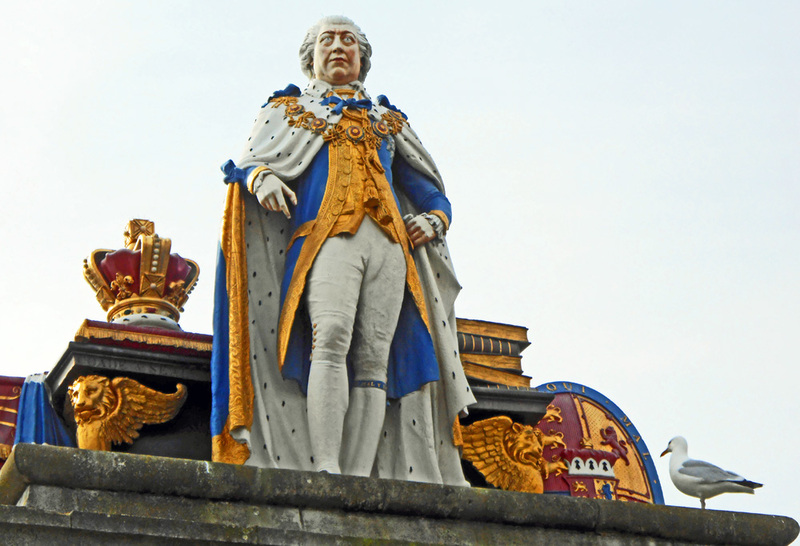 Once the king and royal family began to patronise Weymouth as a summer resort, many people followed the fashion, and accommodation had to be found for them. 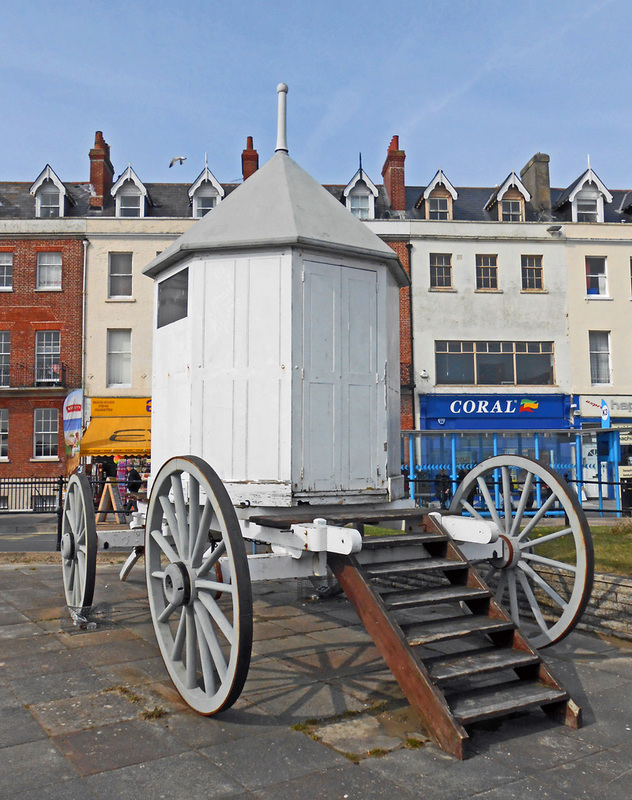 This gave rise to the Georgian architecture that survives today in the Melcombe Regis side of Weymouth. Facing the seafront, elegant town houses were built in terraces with names like Royal Terrace, Royal Crescent, Gloucester Row (which included the house where the king stayed), York Buildings and Pulteney Buildings. The popularity of Weymouth continued to grow, even after George III’s visits came to an end, and right through the first half of the 19th century the Melcombe Regis side of Weymouth in particular expanded even more with more terraces of grand town houses – and they had names such as Frederick Place, Waterloo Place, Belvidere and Brunswick Terrace. This building boom resulted in hundreds of Georgian, Regency and early Victorian houses facing the Esplanade and the beaches. The arrival of the railway in 1857 provided easier access for visitors travelling from London and the south-east, ensuring that the attraction of Weymouth as a seaside resort did not decline. While countless visitors still flock to places like Bath to enjoy the beautiful Georgian streets, Weymouth has remained primarily a seaside resort, and so its attraction as a Georgian town has tended to be not just forgotten, but entirely ignored. Weymouth also has many other interesting features besides its Georgian architecture. It is still a busy port, and upstream of the town bridge is a marina full of sea-going pleasure craft. In 1930, a drawbridge was built to replace a previous swing bridge, and in summer months it opens every two hours to allow tall river traffic to pass. On the south side of Weymouth, the Nothe Fort overlooks the harbour mouth and was designed to prevent an attack by the French. It is one of the Palmerston Forts, sometimes called the ‘Palmerston Follies’, that were built along the southern coast of England on the orders of Lord Palmerston when he was Prime Minister. Begun in 1860, the fort was not opened until 1872. Like all the Palmerston Forts, it was never used. By the time it was ready, the artillery technology was obsolete – and the threat from French attack had passed. Aaron Burr was Vice-President of the United States, and Alexander Hamilton was a former Secretary of the Treasury. Burr had apparently been insulted in a letter written by Dr Charles D. Cooper to Hamilton’s father-in-law. This letter contained defamatory remarks about Burr that had been attributed to Hamilton, but Hamilton would not give a categoric repudiation or apology. He merely pointed out that he was not responsible for Dr Cooper’s interpretation of what had been said. It seems that neither Hamilton nor the offended Burr would back down, and a confrontation was inevitable. The root of the argument was a long-running rivalry dating back at least four years, to the bitter presidential campaign of 1800. The Republicans Thomas Jefferson and Aaron Burr had defeated the Federalist candidates, meaning that one of them would become President and one Vice-President (this was before the Twelfth Amendment that changed how the President and Vice-President were elected). Because they received an equal number of votes, the contest passed to the House of Representatives. Hamilton was already known for his dislike and distrust of Burr, and he engaged in intense political manoeuvring that ended in Jefferson becoming President and Burr the Vice-President. The actual duel between Burr and Hamilton took place early on the morning of 11th July 1804 at Weehawken, New Jersey. Burr was not wounded, but Hamilton was hit by a ball and died the next day. Immediately after the duel, there were warrants out for Burr’s arrest, and from then on he was a disgraced political leader. He became involved in an attempt to create a separate territory west of the Mississipi, for which he was arrested and charged with treason. He was acquitted and went to live in Europe for a few years, returning in 1812. He died in 1836. More than two centuries after that duel, another hotly contested race for the Presidency is likely to give rise to the kind of animosity that led Hamilton and Burr to their fatal encounter. However, duelling is illegal in America (as it was in New Jersey in 1804), so the animosity is likely to be expressed as a war of words. The latest magazine article of ours to be published is ‘The Female Cabin Boy’ in Folklife Quarterly for April 2016, which talks about songs that relate stories of women dressed as sailors and going off to fight in the wars. Check out the FQ website. We have only one more talk lined up for 2016. We have been invited by the U3A to give a talk on ‘Eavesdropping on Jane Austen’s England’ on Thursday 27th October at the Mint Methodist Church, Fore Street, Exeter, EX4 3AT at 10am (the talk starts at 11am). You will need to be part of this organisation to attend, but this gives you plenty of notice. We are so busy writing our book on the Great Siege of Gibraltar that we have no time to spare for writing articles or giving talks in the foreseeable future. We hope to give an update on the progress of our forthcoming book in the next newsletter. We have given two talks recently on the theme of our last but one book, ‘Jack Tar’. It is a favourite talk of ours, and the audiences were very responsive. One comment was that our book is an invaluable one to read before embarking on the series of novels by Patrick O’Brian (or by any other naval fiction writer). If you want to explore some of the available naval fiction of this era, you should start with the website ‘Historic Naval Fiction’. One of the queries we subsequently received was ‘How can we purchase the paperback book in the United States?’ For a while, it has not been available on Amazon.com or the Book Depository website (which ships free-of-charge worldwide). Our publisher has been chasing things up, but unfortunately the book is still unavailable – very frustrating! The ISBN is 978-0-349-12034-8. Found mainly in England, teasels (also spelled teazles) commonly grow on damp grassland, at the edges of fields and on waste ground. They are tall plants with prickly stems and leaves, reaching about 1.8 metres in height. 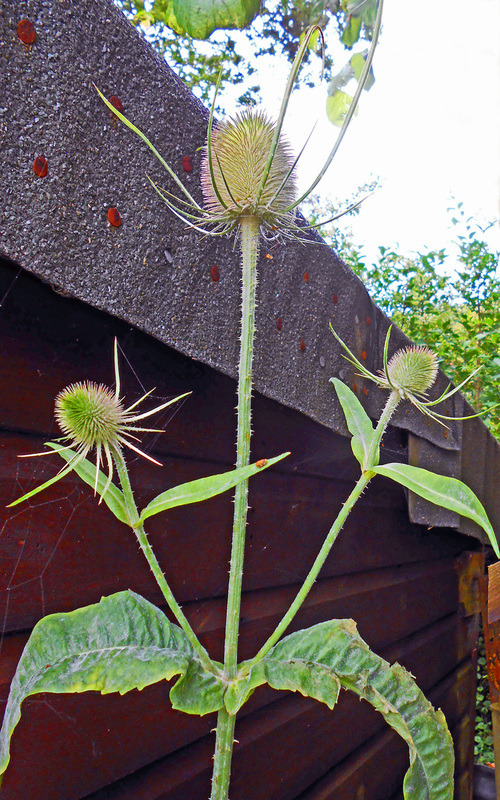 It is difficult to believe that this strange-looking wildflower was once grown as a commercial crop, known as the ‘fuller’s teasel’. 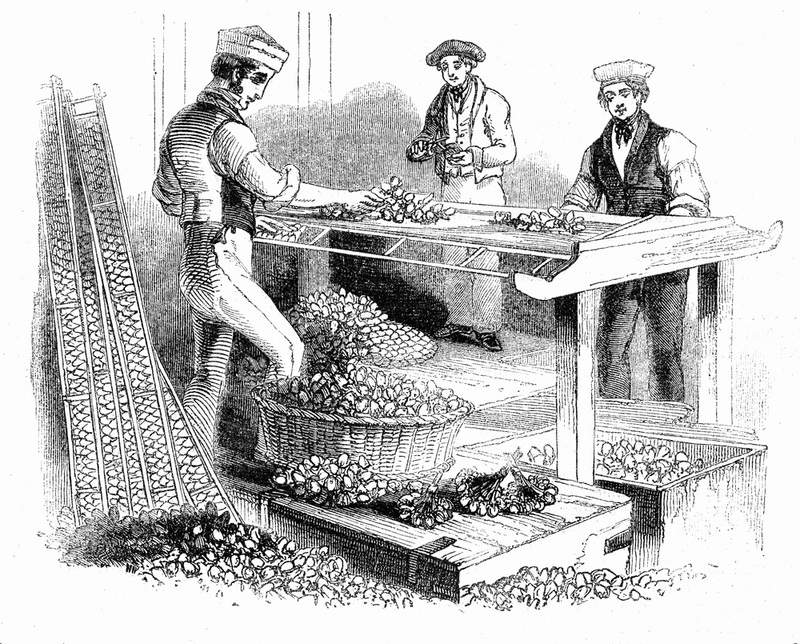 The commercial cultivation of teasels in England continued well into the 20th century, when imported teasels became more common. 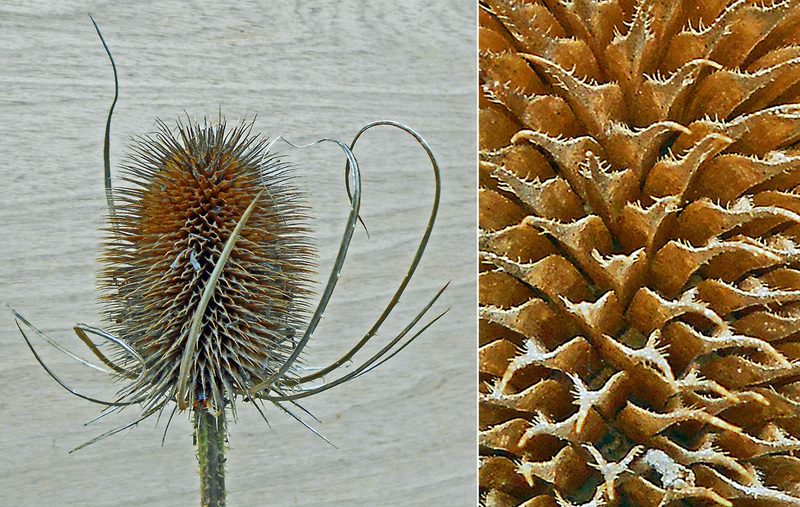 Substitutes such as wire brushes have never supplanted teasels in the production of the finest woollen cloth, and teasels are still used in a few woollen mills in Britain. Fields of teasels were once a common sight, helping to make the landscape look very different in centuries past.